If you are looking for an IT company to support your organization, it is important to understand the differences between IT support and managed IT support. Although the two terms sound very similar, they actually describe very different levels of IT service. Managed IT support goes beyond the basic level of IT support that many IT companies provide. Whereas IT support services will help you to get your IT systems back up and running when something goes wrong, managed IT support is an ongoing partnership between your organization and an IT company. IT support has an unpredictable pricing structure. You pay when you need the IT company to fix something that has gone wrong with your IT systems. While this means that you do not face any costs while everything is working well, when something breaks it can throw your business budget out of balance. In contrast, managed services providers charge a flat fee per month. No matter how many IT problems you face during that time, you pay only the standard monthly charge to have them resolved. This pricing structure smooths out your IT spending and can make it easier to balance your budget. If all you want is IT support when something goes wrong or you need to upgrade your IT systems, you can approach any IT services provider and explain exactly what you need from them. However, if you are looking for an IT company that can act as more of a partner in your IT journey, you should choose managed IT support. Managed IT services providers work to understand your business and its goals. Rather than working on projects as they arise, managed IT support companies are always looking for solutions that can help your business achieve success over both the short and long term. Whereas IT support services solve problems only when they arise, managed IT support companies are always proactively looking to prevent problems so your business can operate as smoothly as possible. You can think of your managed IT support provider as your partner in IT, as they will always be looking for solutions to help your IT systems be more efficient and reliable. For many small businesses, having an entire in-house department dedicated to IT is not realistic. However, you can simulate the experience of having your own IT department by teaming up with a managed IT services provider. Rather than having to call up an IT support company and wait for them to find time to help you, when you partner with a managed IT services provider they will always be there right when you need them. No matter how large or small your organization, it is important to make data security a priority. New cyber security threats are emerging all the time as criminals come up with new ways to steal data from unsuspecting businesses. One particularly nasty form of malware that often affects small businesses is ransomware, which encrypts company data and then demands a ransom to make the data accessible again. A report by Malwarebytes showed that one fifth of companies hit by malware in 2016 had to stop operating completely until the problem was resolved. Properly preparing for a disaster can help you to avoid complete shutdown by putting a solid recovery plan in place. A managed IT support company can help you to develop a cyber security plan that reduces the risk of your organization falling victim to a cyber attack. With cyber security experts on board, managed IT support companies can keep you up to date with the latest generation of threats and proactively suggest solutions to protect your data. They can also help you prepare a disaster recovery plan, which will reduce the impact on your business if an attack does happen. In general, this type of plan involves a system for backing up your data, as well as clearly defined procedures for recovering the data in the event of a data loss or breach. IT Support Vs. Managed IT Support: Which Is Right For Your Organization? When choosing an IT support provider for your business, it is important to consider the unique needs of your company. If you have a strong in-house IT team, you might only need occasional support from your IT services provider. However, for many small and medium-sized businesses, partnering up with a Managed IT Company is the best option. 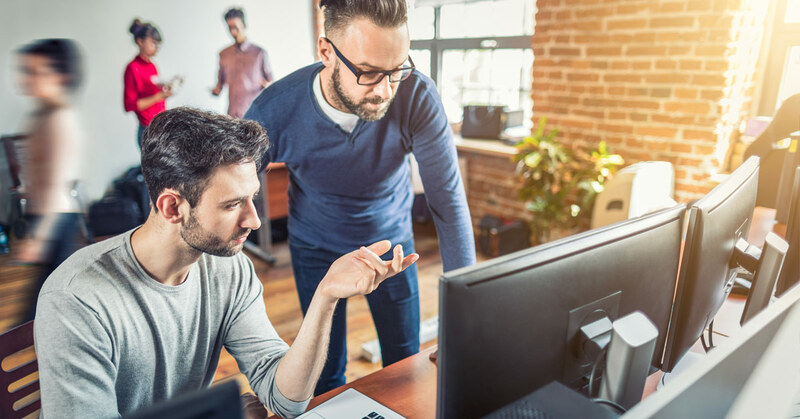 Not only will a managed IT support provider be there to help you when something goes wrong, but they will be working on your behalf every day, looking for solutions that can protect your business’s data or help the organization operate more efficiently. If you want to reap the benefits of such a partnership, get in touch with a managed IT support company today. It could be the start of a long and highly beneficial relationship. If you’re Maimi business is trying to decide if which type of IT support is right for it’s needs, consider giving us a call. We can provide a free IT assessment and help you decide which path will help you accomplish your business goals.